Each time I connect my camera or USB device and try to import images from these devices with Picasa, I found myself with a lot of duplicate files (photos that were previously imported in the Picasa Library and are still on the devices are imported back again). Open Picasa, before connecting any of your devices. Go to Tools> Option > General Tab. 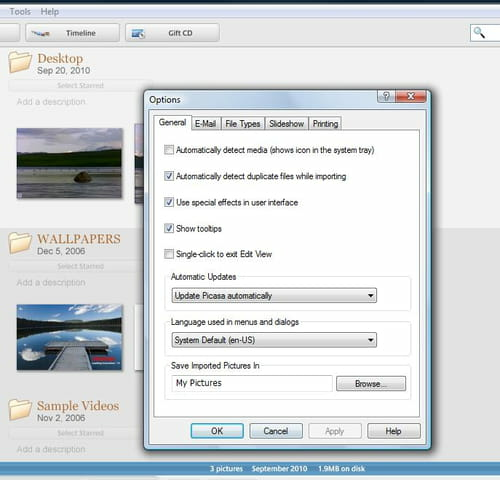 Simply check the "Automatically detect duplicate files while importing" option. Connect your devices, it should be Ok then. Published by deri58. Latest update on November 10, 2012 at 05:01 PM by Jean-François Pillou. This document, titled "Picasa - imports duplicate files," is available under the Creative Commons license. Any copy, reuse, or modification of the content should be sufficiently credited to CCM (https://ccm.net/).